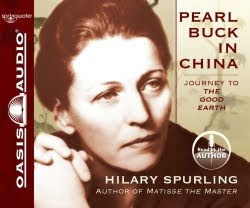 Pearl Buck in China: Journey to The Good Earth, written and read by Hilary Spurling, is my first review for Oasis Audio's new review program. At just over nine hours, this audiobook was fast-paced. Spurling's British accent added to the feeling that I was listening to a story from a completely different place and time. I'm somewhat familiar with Pearl Buck's work -- we read The Big Wave last year for school -- and we have done quite a bit of reading about China during the time that Buck lived there. This biography gave a far different point of view, which I found fascinating. Buck, who lived in China for much of 1892-1934, survived the Boxer Rebellion and various civil wars. She lived in a variety of settings, and as she grew up bilingual, she came to know the people of China well. Chinese peasants were the subjects of much of her writing. It was fascinating to listen as Spurling wove together Pearl's life, the history of China, and events in the United States in this biography. One caution though, since so many of my blog readers are homeschooling parents, is that this biography is probably not suitable for younger listeners. However, it left me wanting to check my library for some of Pearl Buck's works. You know I had to go buy Sixteen Brides because of your review. And it was a great book :). Scouting Saturday: Inventing Merit Badge!!! Oh, the lazy days of summer.... NOT! Free upper level math this summer!